This report covers conditions and observations made between Tuesday September 4 and Sunday, September 30, 2018. The next scheduled report will be posted on Monday, October 29, 2018. In the event of any significant occurrences prior to that date, this site will be updated as soon as possible. Temperatures cooled noticeably during September, providing comfortable conditions for growers and their employees as they worked to bring in the crop. Daily maximum temperatures were reported at their highest levels early in the period, when readings ranged from the upper 90’s to just over 100 degrees, with warmest readings reported in the southern San Joaquin Valley. Temperatures dropped at mid-month into the lower 80’s, rising slightly into the low to mid 90’s during the final week of the period before dropping back into the lower 80’s as the period concluded. Morning lows followed as similar pattern, with readings dipping into the lower 60’s early in the month, then settling into the upper 50’s as the month progressed. 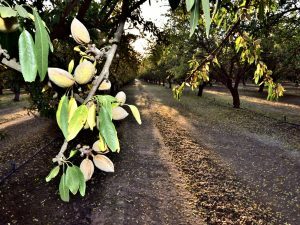 Growers in all areas of the Central Valley were focused entirely on harvest during September, as they worked to bring the crop in from the orchards. As noted in last month’s report, harvest operations have been hindered by the diverse maturity of the crop. This has produced several undesirable results. Poor shaking conditions in the “worst” orchards have left an excessive number of nuts in the trees. 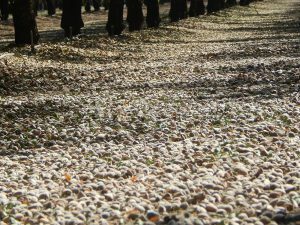 “Green” nuts in the crop have required additional time on the ground to dry. 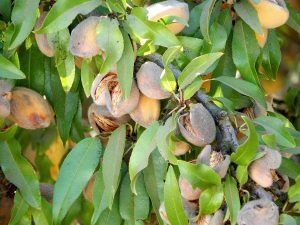 Increased stress within the orchards as growers wait for nuts to dry, delaying irrigation needed prior to shaking the next variety. 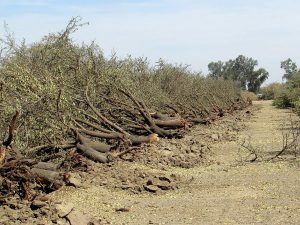 Conditions were aggravated by increased humidity levels that accompanied the mid-month reduction in temperatures, further delaying removal of the crop from the orchards. In the most extreme cases, some orchards have begun to yellow and partially defoliate. 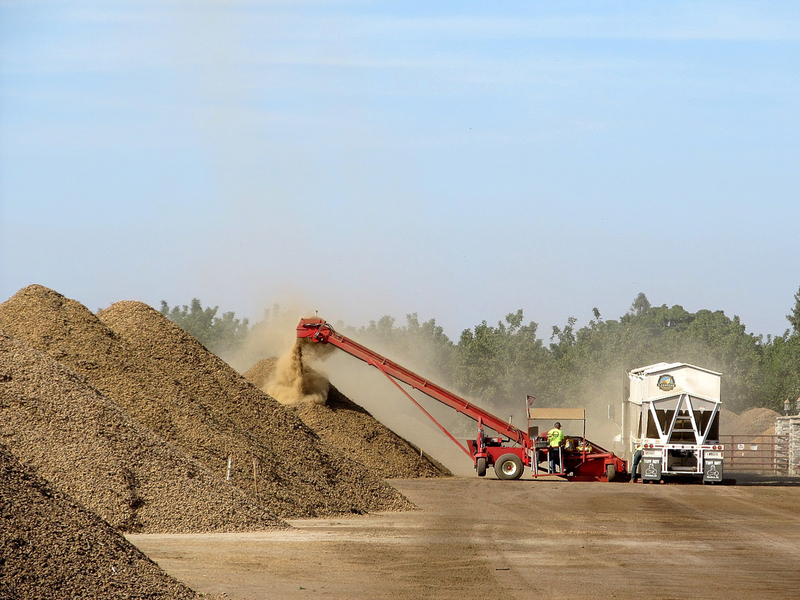 The flow of product from the orchards was also reduced enough in some areas to inspire a few huller/sheller managers to pick up some previously harvested stockpiles in order to keep their facilities operating efficiently. Nevertheless, growers have picked up all but the last of the early maturing Nonpareil, Independence, Sonora and Price varieties and were working through the Carmel, Butte and Padre during the latter half of the month. 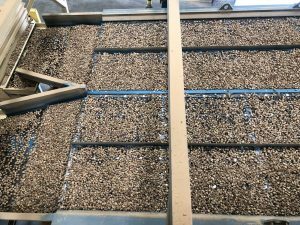 As this report was being prepared, growers in all areas have begun shaking the traditionally last-to-harvest, late maturing Monterey and Fritz, with observers in the southern San Joaquin Valley reporting the most advanced harvest. Some elected to make additional treatments for Navel Orange Worm, NOW, prior to shaking the later maturing plantings, heeding to the indications of another generation of the insect found in monitoring traps placed within the orchards. Yields in all areas continue to vary widely. Production levels range from 20% to 180% of the 2017 crop, obviously the result of the freezing conditions experienced during the bloom. 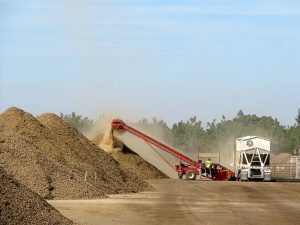 On average, growers in the northern San Joaquin Valley experienced Nonpareil yields slightly above 2017 levels, while those in the Sacramento valley and the southern San Joaquin are reporting sub-standard production. Yields in the various pollinizer varieties are yet to be definitively identified. However, while the Aldrich and Price varieties in the northern San Joaquin are running at better than last year levels, early yields within the balance of varieties have been reported at lower levels than experienced in 2017. NOW continues to dominate grower’s thoughts. On average, damage levels are running below last year’s excessively high levels. However, some growers continue to experience elevated reject levels, more so in the southern San Joaquin Valley. Many have noted the number of nuts remaining in the trees after harvest as a source of potential damage in the 2019 crop. Weather forecasters are predicting a threat of rain during the first days of October, produced by the combined effects of Hurricane Rosa to the south and a cut-low pressure system off the California coast. 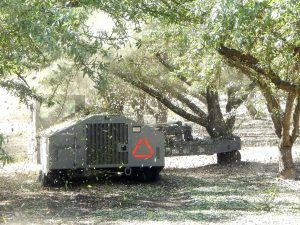 Growers with previously shaken nuts on the ground were rushing to sweep and pick up the driest of their crops prior to the arrival of the rain. Meanwhile, the best option for those with crop remaining in the trees is to wait until after the threat of rain passes. Should the rain materialize, some crop will be caught in the open, delaying its removal from the orchards and possibly requiring drying after hulling and shelling. With each passing week, rainfall becomes an increasing possibility. This fact weighs heavily on grower’s minds as they work to complete the final weeks of harvest. Those growers who have completed their harvest have moved into a post-harvest mindset. Irrigation, pruning, application of soil amendments and post-harvest fertilizers have become prime activities for many. Irrigation districts will end their delivery seasons during the coming month and all want to get in a good post-harvest irrigation before supplies run out. 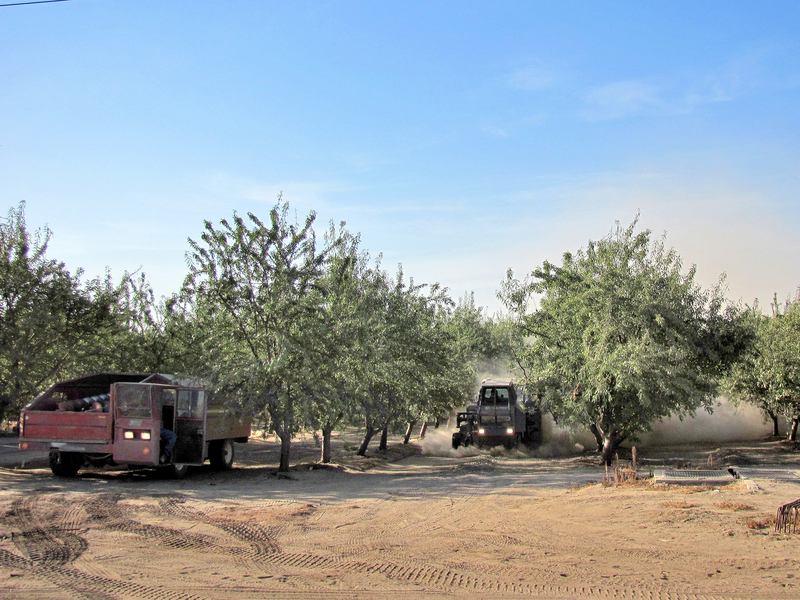 Those planting new orchards have worked through the summer preparing lands for planting, while those removing older, low producing orchards have already begun the process of removing their trees.